I know what you're thinking - doesn't that sound a bit too health-conscious for Sarah? Where's the butter? Where's the chocolate? Where's the damn peanut butter swirl? I know this type of baking is a bit of a departure for me, but fear not. I haven't been sucked in by the powerful coconut flour lobby with the lure of free samples to spend my precious free time writing about things in which I have no interest. I've actually just been spending up big at health food stores and having fun experimenting with coconut products in my baking. (I trust you all to know that even though I do sometimes take free samples - albeit not that many of late - I only accept things that I am genuinely interested in, and only write about them if I've actually got something to say about them). So, my obsession with coconut products. A good friend of mine is a body builder, and I've often accompanied her on trips to the health food store over the past few months. Whilst she's all about the protein powder, Quest bars and pre-workout, I was just like: "Ooh! Activated almonds! Pretty teas! Fancy muesli! Agave syrup!" I never bought anything though, because a) it's expensive and b) I didn't know what to do with it. 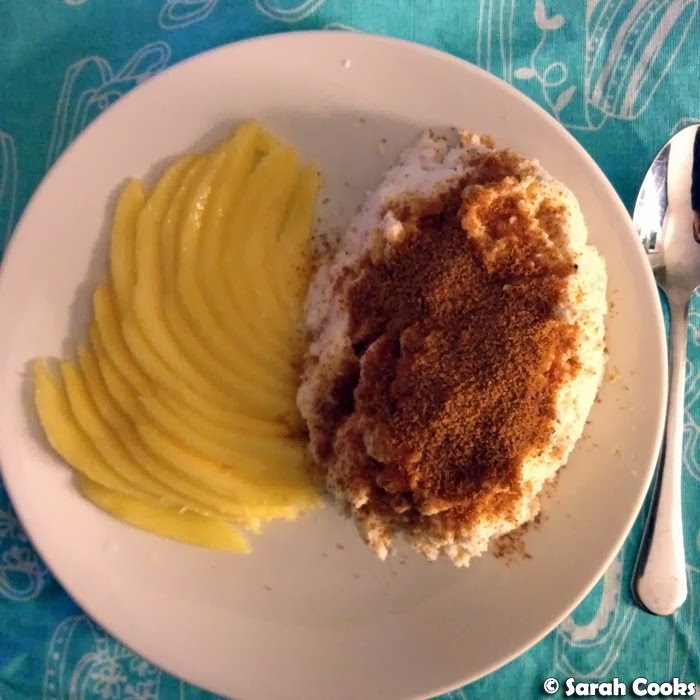 Then one day Sandra bought some coconut yogurt and dee-licious coconut sugar to try. And that was it. Demon unleashed. I wanted All Of The Coconut! I've been putting the coconut sugar on my yogurt in the morning - it tastes like my beloved rapadura sugar, is higher in minerals than ordinary white sugar, and low-GI too - yay! I tried the coconut yogurt (AKA Co-Yo), and I really loved the flavour - super coconutty! However, I don't think I'll be buying it too often - it's really expensive (about $11 for 250 grams), and very high in saturated fat (17% total fat, 13% saturated fat), with very little protein and no calcium at all. I don't get why they call it "guilt free" on the Co-Yo website. It literally has that oily, thick appearance that coconut cream has. After that, I went to my local health food store and bought some coconut crunch, and coconut flour to try. Coconut crunch is the dried flesh of a coconut after the coconut oil has been extracted, and you use it in the way you would use psyllium husk - sprinkle it in your cereal or add it to baking for a huge fibre boost. Coconut flour has the virtues of being low carb and ridiculously high in fibre (39% fibre!). Again, it is higher in fat that ordinary flour, but the other nutritional benefits balance it out, methinks. I'm told you need less of it when baking, as it absorbs a huge amount of liquid - so you'll often see coconut flour recipes with a very high ratio of eggs-to-flour. I tried making some coconut power porridge for a snack - I found it on the Niulife website - you just stir some milk and coconut flour together, and it thickens almost instantly into a puddingy mixture. Y'all know I love eating a proper breakfast at home (and Instagramming it! ), and am always on the lookout for something quick and healthy. I found it a little dry and mealy, even with the addition of sliced mango on the side, so I'll be working on tweaking this recipe to my liking. Watch this space. 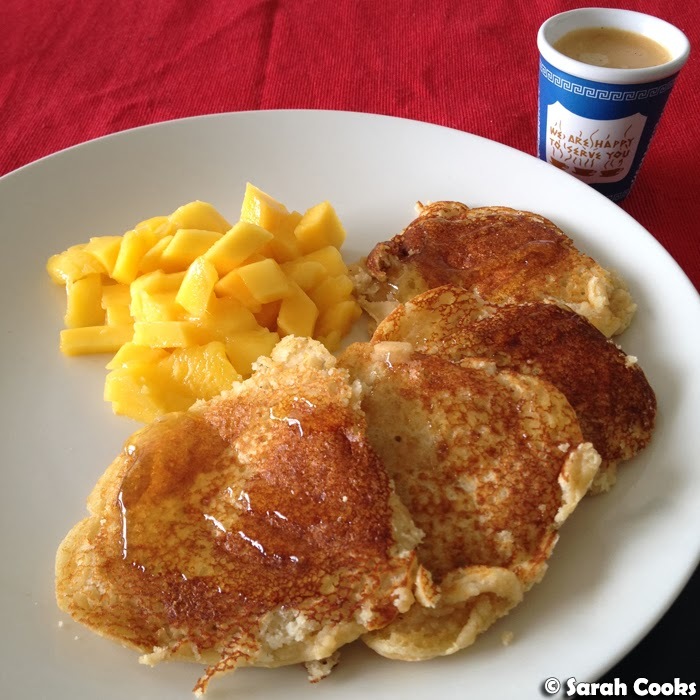 I made some coconut pancakes (recipe here), which I served with diced mango, honey and an espresso. Really delicious! The pancakes were impressively fluffy and soft, and the texture reminded me a little of my beloved ah pong. You can see they were a little messy - they're quite a bit softer than normal wheat-flour pancakes, and I tried flipping them over before they were totally set on the bottom. Whoops! 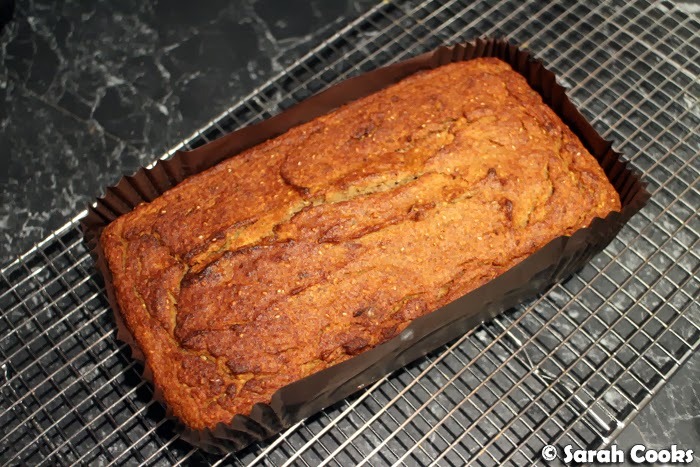 Now, let's have a look at the coconut flour banana bread! I had a few overripe bananas hanging around, and thought it would be a good opportunity to test out the coconut flour! I googled a recipe, and came across this one from Teresa Cutter which used coconut flour, chia seeds, coconut oil, bananas and dates, all of which I had in my kitchen. I added walnuts for crunch and deliciousness. The Chobani frosting isn't strictly necessary, but I've been looking for an excuse to make my strained-Chobani frosting again - I strained the yogurt overnight, then mixed it with some icing sugar and lemon juice. Ta-dah! The "fudge" part of the recipe comes from a few generous spoonfuls of coconut sugar sprinkled over the icing. It dissolves into the icing, becoming caramelly and fudgy. (Like Nigella's Barbados creams). The bread is so moist, with a gentle coconut flavour and just a mild sweetness. It lasted for a good week in the fridge. I cut off thick slices for breakfast, for a snack, and to boost my energy before a cardio workout. I gave half the loaf to my bodybuilder friend, and she said she loved it! Yay! I haven't tried these variations myself, but I think you could add vanilla protein powder to the icing instead of icing sugar to boost the protein content, and given how moist it is, I think you could add coconut crunch or psyllium husk to boost the fibre content without it drying out. It happens to be gluten free, but don't make the mistake of equating "gluten free" with "healthy". I call BS on that. Just because something's in the health food aisle doesn't automatically make it better for you! It really irritates me when people automatically associate gluten free with better nutrition (and indeed, I've spent many a night whining about this with my friend Jess, who suffers severely from coeliac disease, and has a very restricted diet). A gluten free diet is a necessity for people who suffer from medically diagnosed coeliac disease, an autoimmune disorder which causes an inflammatory reaction in the small intestine whenever gluten is ingested, and can lead to digestive distress, lack of vitality and an inability to absorb nutrients, even hair loss. However, for people with a normal healthy gut, no such reaction occurs, and eliminating gluten from the diet has no health benefits in and of itself. Indeed, many of the "gluten free" products you see in supermarkets, like pasta, biscuits and cake, are made of highly refined rice flour and corn flour, mixed with chemicals to replicate the texture that would come from gluten. A low fibre, high-GI carbohydrate bomb that will cause a massive spike in your blood sugar levels! These aren't "health" products, but rather, specialty products made for people with gluten intolerances who can no longer enjoy the foods that they once did. 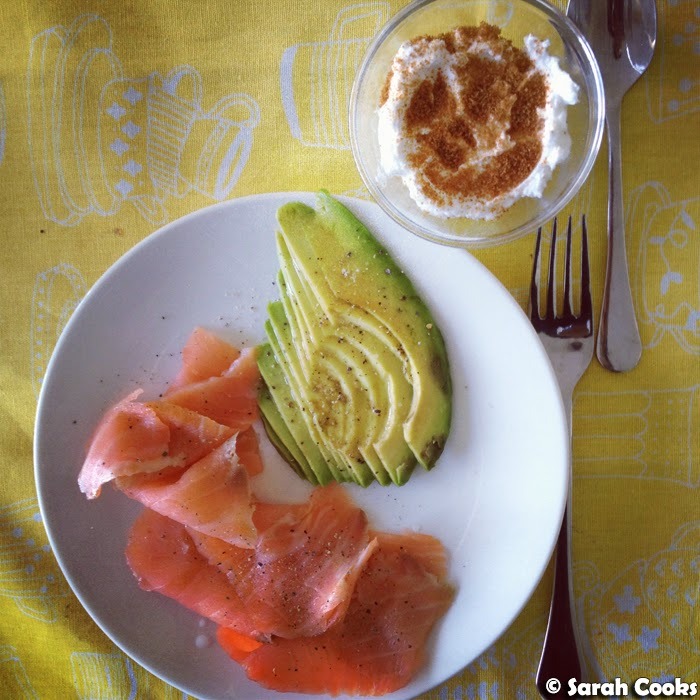 Back to happier topics - have you baked with coconut flour? Do you have a favourite coconut flour recipe? Are you as obsessed with health food stores as I am? 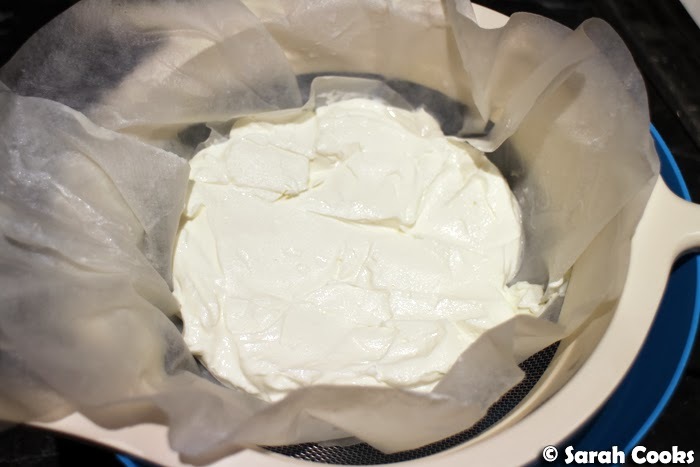 Line a sieve with muslin or coffee filter paper and place over a bowl. Spoon in the yogurt, then cover loosely with glad wrap and leave in the fridge overnight for the excess water to drip away. The next day, discard the liquid that has collected in the bowl. Tip the drained yogurt into a clean bowl, add the lemon juice and whisk in the icing sugar until it tastes sweet enough for you. I'd start with 1/4 cup, then taste and add more if you like. Preheat the oven to 170C. Line a loaf tin with baking paper. (My loaf tin is 29cm x 14cm x 7.5cm). Soak the dates in boiling water from the kettle for 20-30 minutes, or until softened, then drain and discard the soaking water. 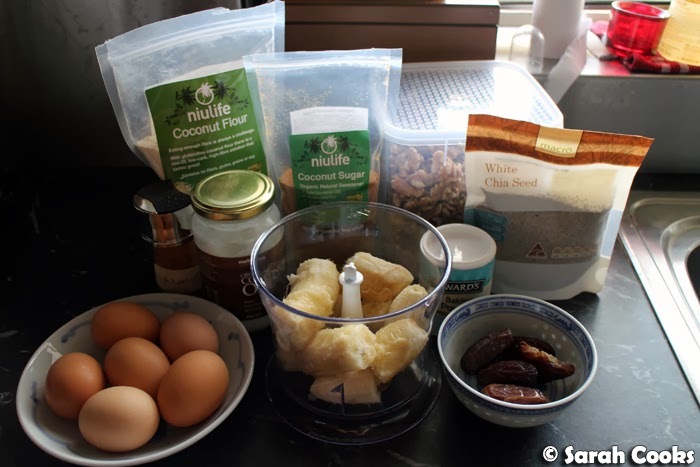 Place the dates, bananas, eggs, coconut oil and cinnamon in the bowl of a food processor, and whizz thoroughly to combine. Scrape the mixture into a large mixing bowl. Add the cinnamon, baking powder, coconut flour, chia seeds and chopped walnuts. Stir with a wooden spoon to combine. Leave the mixture to rest for 10 minutes so that the coconut flour and chia seeds can expand and the mixture can thicken. 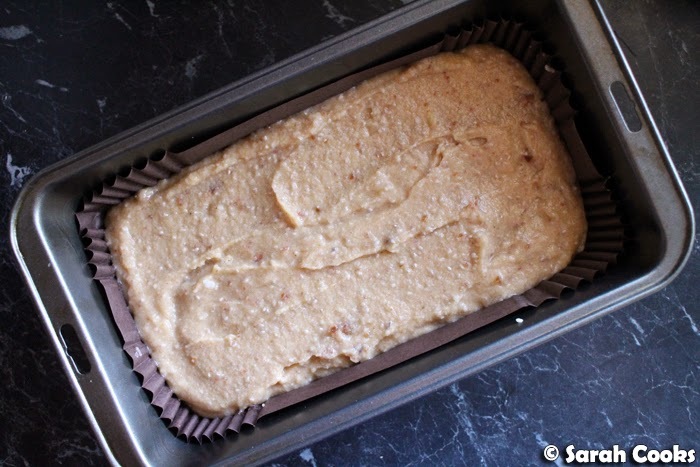 Scrape the mixture into the prepared loaf tin and smooth the top with a spatula. Bake for 45-55 minutes, or until a cake tester comes out clean. Remove to a wire rack to cool. 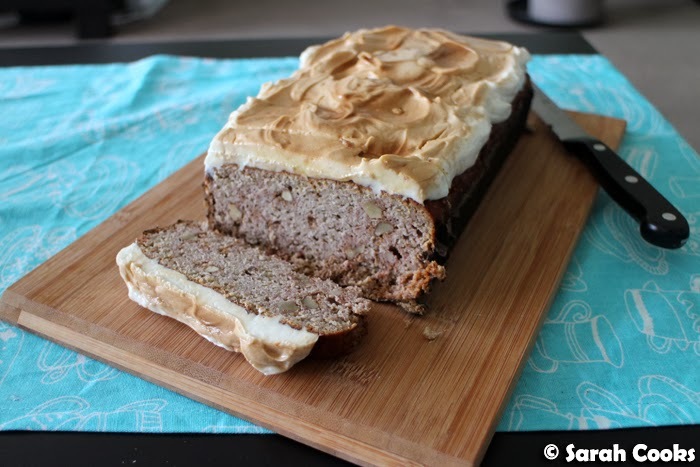 Allow the banana bread to cool completely before adding the frosting. 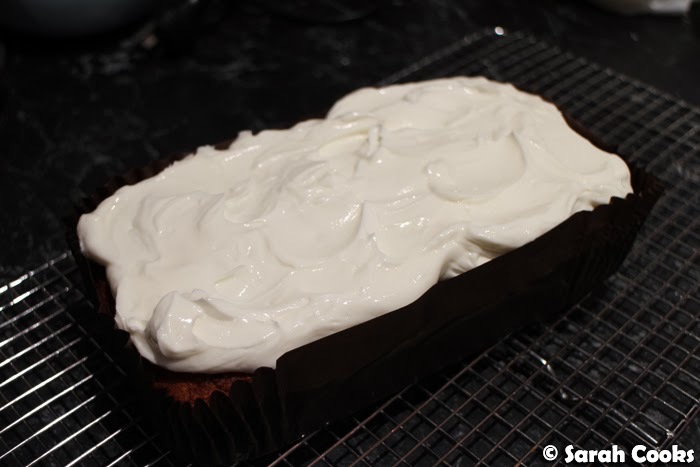 Spread the frosting thickly over the banana bread, making a wavy pattern. 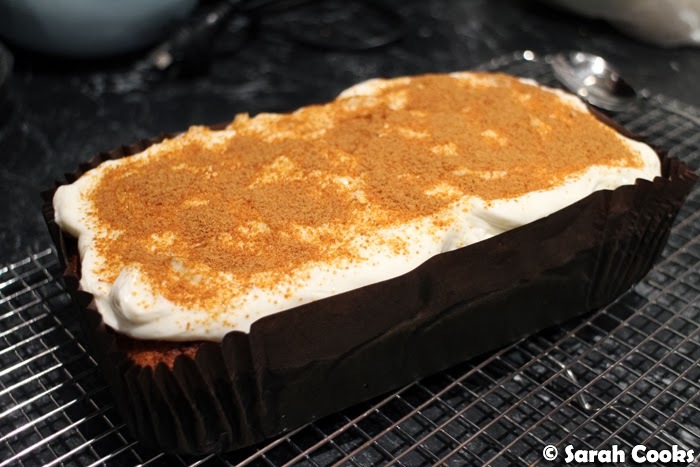 Sprinkle a thick blanket of coconut sugar over the top. Allow the sugar to start dissolving into the frosting before serving. That sounds so amazingly healthy! I'm not a huge huge fan of coconut flavours, but i can imagine the subtle coconute taste with the sweet bananas. yum! I'm not really a coconut fan but sometimes when its thrown in subtly (like gelato messina's toasted coconut and mango ice-cream) I love it! High five! This might just be the kick-in-the-pants I need to stop using all my coconut flour to make endless batches of my black sesame coconut flour muffins. Awesomeness! 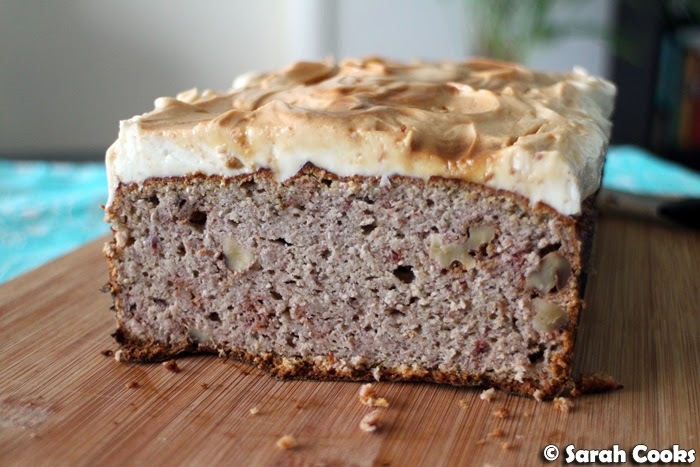 I love Banana Bread with Yoghurt, haven't tried it with coconut flour! Shall bookmark! Haha I'm the same when it comes to new age health foods but I was similarly intrigued when we had a coconut oil dressing on a salad recently. It was so delicious! Your pancakes look amazing but I love the idea of a banana bread that's like, totally, good for you! :) Gimme a double portion please! was just thinking about how i'd like to make a healthy sweet treat, and this is right up my alley. also, totally agree with gluten free. i wrote up a post about different grains lately, and it's the same kinda thing. Made this over the weekend and it was delish! So coconutty! Also added extra bran so it was practically like eating a salad, right?